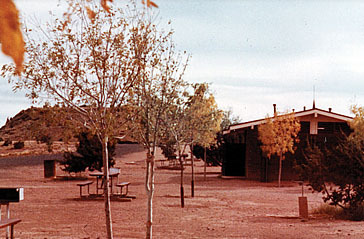 Lyman Lake campground in 1969. Lyman Lake State Park is located in northeastern Arizona along the Little Colorado River in Apache County between St. Johns and Springerville just off of US 191. This 1500 maximum surface acre lake is an irrigation district reservoir that can experience a considerable annual draw down for irrigation purposes. The lake is a popular fishing spot. When the surface acreage is large enough, water sports activities are very popular. The lake is located at an approximate elevation of 6,000 feet and is close to the White Mountains. Lyman Lake was first brought to the attention of the State Parks Board at its meeting on June 6, 1960. Director Dennis McCarthy reported to the Board on a meeting he had with Representative James S. Shreeve, from Apache County, and Game and Fish Commissioner E. J. Becker, of Springerville, when Lyman Lake had been suggested as a potential state park. He also advised the Board about a herd of Buffalo to be grazed in the area of the Lake and adjacent to the highway that could be considered as an additional tourist attraction. As a result of that meeting, the Director had the State Parks landscape architect, Howard Cox, spend a week at Lyman Lake gathering information to develop a preliminary report on the potential of this area as a state park. At the October 3, 1960, Parks Board meeting, the Director McCarthy reported to the Board that on June 12, 1960, he had met with members of the Lyman Water Company, Apache County Board of Supervisors, and interested citizens in St. Johns. Following that meeting, the Director and his staff had numerous contacts with the Lyman Water Company to obtain the necessary information to provide a comprehensive report and preliminary Master Plan for consideration by the Parks Board. The Board authorized the Director to negotiate a lease with the Lyman Water Company for 160 acres of desirable and necessary land adjacent to the Lake. Lyman Lake Contact Station in 1971. The twenty-five year lease agreement between the Parks Board and the Lyman Water Company for 160 acres on the lakeshore was signed on December 1, 1960. 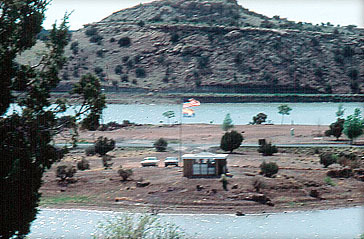 Thus, Lyman Lake became Arizona’s first recreational State Park and the fourth in the system behind Tubac Presidio, Tombstone Courthouse and Yuma Territorial Prison. The official dedication of Lyman Lake State Park was held on July 1, 1961. Raymond Rucker was the first Park Manager. Over the years, additional lands have been included in the Park. In 1964, 60-acres were added through a Recreation and Public Purposes Patent. A lease from the State Land Department added 220-acres in 1979. In 1984, 820-acres were added through a Recreation and Public Purposes lease. However, 360 of those acres were relinquished by State Parks in 1998 to resolve a potential lawsuit. A Road Easement from the Lyman Water Company in March 2003 added 20-acres to the Park which increased the total acreage to 920.